Omutuuze wa Uganda, Basajja Mivule nga yemulugunya eri abagala okwongera okuleeta entalo enfu munsi ya Buganda. Omutuuze ono afunika ku Baba TV ne NBS network eza Uganda. KCCA and Mulago hospital mortuary that has got to make money to pay the wages of its workers. In public hospitals, most mortuary attendants usually look and act like generally harmless individuals, but that is until you have to deal with them. It is then that their ghastly side pops up. They are the cash conduit for a morbid death racket which piles more grief on the bereaved. Faridah Nabukenya lost her brother, Abud Muwonge, 33, in May at Mulago national referral hospital. But she’s still traumatized by what she went through at the City mortuary, a facility being used by Mulago since renovations at the national referral started in October, 2014. “Abud died at around 5am as doctors were preparing him for abdominal hernia operation. Immediately two men arrived in an ambulance and took his body to the city mortuary by force yet we had asked doctors to release it at the hospital ward. We attempted to stop the men because we wanted to avoid the hell at the mortuary but they refused and told us to find him there,” she says. Muwonge’s body was only released to family members, who arrived at the mortuary by 7am, several hours later at 12noon. The doctors and morgue attendants wanted Shs 200,000. “After paying mortuary administrators Shs 20,000 for forms that allow us to transport the body, we waited for hours without communication from them. We went back for inquiries and one of the workers pulled out a wooden chalk board behind his seat, and showed us different charges of what we were supposed to pay before receiving the body,” she told The Observer. Nabukenya remembers being shown charges ranging between Shs 50,000 and Shs 400,000 depending on how the person died. “When I refused to pay and threatened to leave them with the body, they opted for negotiations. I paid Shs 100,000 and they brought the body, dumped it on the mortuary veranda while it was still dripping blood. They did the postmortem without requesting us and the body wasn’t treated,” she says, adding that her money was taken but it wasn’t receipted or recorded anywhere. “All the clothes wrapped around him were full of blood and we suspect they cut out all his organs. His body was full of stiches, and had turned so dark. It was too scary,” she says. Another victim, one Namukosi, who lost a brother, Jumah Muganza, in an accident along Entebbe road last year, says city mortuary attendants and doctors asked for Shs 500,000 to treat, dress, clean, carry out postmortem and issue a death certificate. “We refused and requested to enter the mortuary and pick the body ourselves. After identifying Muganza’s body, they told us to bring the coffin. When we returned, we found more than ten decomposed and injured bodies, which were smelly and dripping blood had been piled on Muganza’s body. We were shocked and ran away,” she says. They had no option but to mobilise Shs 500,000 from friends and relatives and paid. Within 30 minutes, they received Muganza’s body in the coffin. When Francis Kakooza died in Mulago’s casualty (emergency) ward on June 27, his relatives were forced to pay Shs 100,000 before being handed his remains. “Do you think there is something for free here? When you don’t pay, they ignore you and work on those who pay. They can tell you to wait for the whole day until you realise that you have to pay,” Fred Musoke says. “You can’t remove a body from the mortuary without paying, and the more it delays in the mortuary, the more charges, and if it is unclaimed after four days, they take it for burial at Lusaze or Bukasa public cemeteries to create space for new bodies,” a source at the mortuary said. At the mortuaries of Kawempe and Kiruddu general hospitals, the going rate is between Shs 30,000 and Shs 50,000 for attendants who claim it is fees for treatment, cleaning and dressing bodies. “I lost my baby boy last night (July 3) because I delayed to pay doctors to help me deliver. At the mortuary, my husband paid Shs 30,000 for the release of the body,” one Doreen Nalubega said. 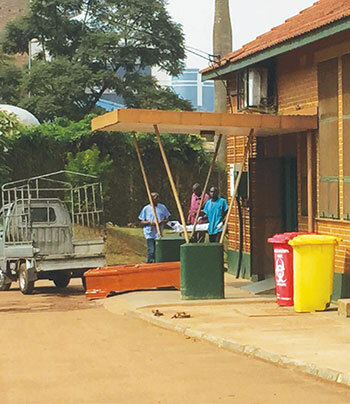 Sources at Mulago allege that these illegal fees are shared between pathologists, doctors, attendants and mortuary administrators, a claim the authorities vehemently deny. “Which institution is not corrupt? Judiciary, police and also media need money to do the work. The whole system is corrupt. Pathologists and mortuary attendants get poor salaries yet their job of opening bodies daily is so risky. It comes with many infectious diseases…” a source says. Tony also died in an accident at Namanve, Jinja road on June 26. His people told The Observer that they paid Shs 70,000 to City morgue attendants to receive the body. But Dr Samuel Kalungi, the pathologist at the City mortuary, says he examined Tony’s body free of charge. “People fear crossing the mortuary compound and come to our offices behind to collect information about retrieving bodies. Conmen take advantage of this and defraud innocent Ugandans,” he said. “People get traumatised and depressed after losing their dear ones. They fear to come to mortuaries. But there are conmen at the mortuary who take money from desperate relatives under the pretext of processing the postmortem,” he adds. Kalungi says some relatives also con their own family members, claiming the money is for mortuary attendants. Admittedly, dealing with death is a dark business. As Dr Male Mutumba, a pathologist at Mulago hospital, says postmortems are rather graphic. A body is assessed to determine unique features such as birth marks, scratches, height, etc. “Then we open it up to examine if it was abnormal or natural death. We remove organs and examine them individually to know the exact cause of death,” he says. There are claims about organ harvesting for whatever reason, including witchcraft, but Mutumba dismisses this. “We don’t deal in human organs. When a person dies, all the organs die. We can’t put them in any other person. The time between the death and validity of an organ is very short. People are brought here after hours of death and their organs are useless,” he says. “Inside the mortuaries, there are a lot of bodies and many are open. The process of cutting is very traumatising. But what surprises me, policemen are among the people who fear dead bodies most. Most of them come out of the mortuary running and vomit all over the place and others collapse,” he says. Mutumba says postmortem is usually performed when the person dies suddenly. “If a person dies in hospital and the doctors are not sure of what they have been treating, they can request for a postmortem. But if the diagnosis was clear, postmortem is not needed,” he says. Dr Moses Byaruhanga, the director, Police Health Services and police forensic pathologist, says public hospitals do not have a policy permitting charges for postmortem or mortuary services. “Postmortem is free. But we get cases where people are forced to pay. We don’t know the real perpetrators of this vice, but we shall arrest them,” Byaruhanga says. “We send bodies to the mortuary to pick statistics and it’s the last office to pass when somebody has died. On average 15 to 20 bodies go through City mortuary daily,” he says. But the vice is rather widespread. At Masaka, Jinja, Mityana and Gulu regional referral hospitals, morgue attendants reportedly also extort money from relatives, claiming it’s for postmortem, treating, cleaning, dressing and storing the body. “We have just seen an incident where a kakwaya (mortuary attendant in Busoga region) was fighting to grab the body from the relatives to take it to the mortuary, claiming it must pass there. His intention was to extort money. However the relatives overpowered him and took their body,” Fred Mugarula, a patient at Jinja regional referral hospital, said. A source at Jinja hospital says, if a kakwaya asks for money and relatives either refuse or insist on entering the mortuary, they pull out all bodies at once from the refrigerator shelves, which can be very scary. “After that terrifying experience, you have to pay,” a source says. Doctors at Jinja hospital said mortuary fridges broke down last week. The morgue is now a stinking mess which has attracted stray dogs that jump through windows at night to mangle bodies. The hospital director, Edward Nkurunziza, says they have released Shs 24 million to repair their nine fridges. “We can’t buy new fridges. One fridge with nine shelves that stores nine bodies costs Shs 100 million yet we already don’t have enough money for drugs to save lives,” he says. Masaka hospital’s principal administrator Edward Kabuye says, although postmortem is free of charge, they have received reports of mortuary staff extorting money from relatives and were forced to refund it. “Bodies brought to the mortuary by police are released by police since it might have crimes attached. Sometimes police also extort money from relatives but people connect all these bribes to hospitals,” Kabuye says. The attendants also have a sad story to tell; working in a highly infectious environment without the recommended facilities. “We don’t have pathologists; we use doctors to do the postmortem but since people don’t want to pay, doctors dodge it. Do you expect us to do everything for free, especially with bleeding accident bodies?” one said. Another said that since the police have a copy of the keys for the Masaka hospital mortuary, they dump bodies there without documentation. Many are left to decompose since there are no fridges, putting the attendants’ lives at risk of infections. “We are going to buy a fridge which protects six bodies. It will cost Shs 75 million and since it’s expensive, if bodies are more than six, others will be preserved with formalin,” Kabuye says. Sources at Gulu regional referral hospital said last month they were faced with the astonishing case of mortuary attendants illegally selling coffins inside the morgue itself! “Sometimes the attendants tell us the coffins belong to people picking bodies. But we warned them since it is illegal,” said Yonas Oboth, the administrator. But with no pathologists working here, medical students from Gulu University are said to be doing postmortems. For now, Byaruhanga advises the public to report any attendant who holds onto a body for selfish reasons. But sometimes, he says, they also get complicated cases which delay people at the mortuary. “Sometimes they bring decomposed bodies, smelling; and opening them will disorganise the whole place. We tell relatives to wait and handle such bodies due to their state,” he says. The story was supported by African Centre for Media Excellence. This is where the saying goes for grandfather's saying. Ensi egula mirambo naye no nga temuli wuwo. This sort of mortuary administration of the dead started during the killings at Nakulabye, Kampala 1964 and the invading of the King's palace in 1966. 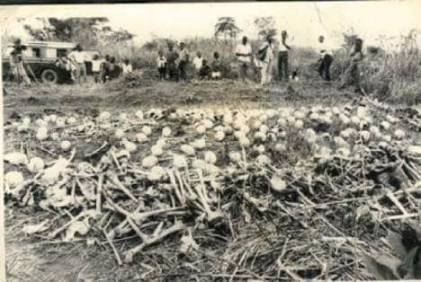 There were no need for bush morturies in the Luweero triangle civil war that killed over 1 million Uganda citizens.